Have you made Carne Guisada? 1. Garlic powder Salt Pepper Cumin Cut pork into tiny pieces. 2. 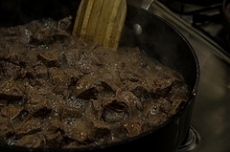 Brown in shortening; add chopped onion and tomatoes; stir together. 3. Add flour slowly (do NOT use masa harina!). Stir till thickened as like gravy, then add 2 cups water. 4. To suit, add: garlic powder, salt, pepper, liberal dose cuminutes Stew on medium low for 30-45 minutes. This recipe contains potential food allergens and will effect people with Wheat, Gluten, Tomato, Beef, Onion allergies.